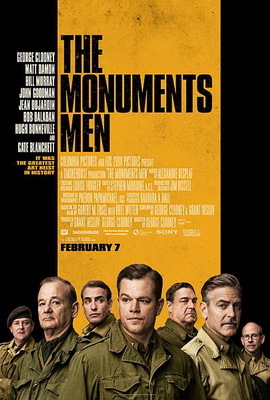 Such is the premise of The Monuments Men – humanity will always find a way to survive. Hitler’s concentration camps effectively wiped out 70 percent of the Jewish population (which was the latest form of persecution levelled at the Jews and far exceeded anything they had previously been subjected to) and today Jewish culture and its population are still thriving. But destroying a culture’s tangible achievements has a sense of finality to it that cannot be reversed. This is a fantastic storyline that is well worth exploring on the silver screen. Unfortunately, George Clooney’s version felt a bit like Ocean’s 11; the director and a bunch of his mates doing another heist story. While this formula can deliver funny and slick films, telling this story in this manner felt slightly disrespectful. Other directors have demonstrated that it is completely possible to tell a story set during the Second World War that have elements of humour (Saving Private Ryan had very funny moments which starkly contrasted against the monumental tragedy of the film), but this movie conveyed no sense of urgency, hopelessness, fear or any kind of bleakness one knows to be true of war. It felt like a group of lads going on an adventure. This might have been cute if it wasn’t set against one of the most horrific human tragedies in history. There was one female character in the film (played by the exceptional Cate Blanchett). I realise in the 1940s, feminism was still in the process of gathering enough steam to push women onto the world’s centre stage; this film could be called accurate in its absence of women. Nevertheless, it’s not like there were no women at all; much like today, they were a planet-wide phenomenon. And they weren’t just sitting around twiddling their thumbs waiting for the Y chromosome to come rescue them – they were going to work, looking after their families and contributing to the war efforts. During her acceptance speech at the Oscars this year, Cate Blanchett stated ‘female films with women at the centre are (are treated as) niche experiences. They are not. Audiences want to see them.’ She’s absolutely right. Good thing she was in this film – she provided a little variety. Whatever the flaws of this film, you can’t fault the acting (I don’t think John Goodman has ever turned in a performance that wasn’t fantastic). But while the scenes containing snappy dialogue and quick back and forth between some of Hollywood’s finest were enjoyable, they were clumsily interspersed with attempts to bring emotion into the piece. For example, James Granger and Claire Simon (played by Matt Damon and Cate Blanchett) regard each other with disdain and suspicion until suddenly Claire decides James is not such a bad guy after all and invites him back to her house. There is no preamble or inkling that this might happen. It seemed like Mr Clooney was worried that there wasn’t enough depth to the film and thrust a semi-romantic scene into the film to give it emotional range. I enjoyed the witty one-liners and chemistry between the fine actors, and even laughed out loud at several points. 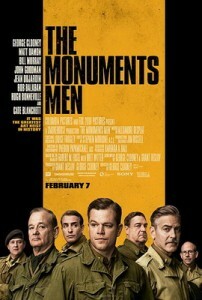 But despite its charm, The Monuments Men is utterly forgettable. This entry was posted in Film and tagged film review. Bookmark the permalink.